Super slippery coming westbound down the hill on Memorial. Needs some anti ice agent applied badly. Major ice on the turnout to Anderson/bow bottom trail off Deerfoot. 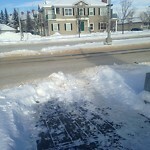 Snow and ice build up on pedestrian cross walk. Makes it dangerous to cross especially with strollers or if physically challenged.